Native American Music Award winner! If you prefer, you may send a check or Money Order to the address listed below. If you are outside of the United States, please email us to receive a total including the shipping fee. 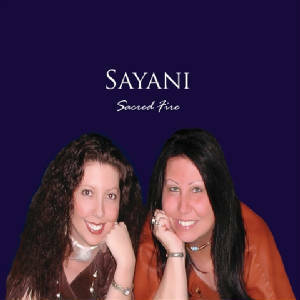 Sacred Fire is a cultural adventure in sounds and styles that blend together for a truly unique musical experience that will speak to the heart, lift the spirit and soothe the soul. The album won the 2010 Native American Music Award (Nammy) for Best Gospel/Inspirational Recording. Jorie and Christie West, make up this mother/daughter duo whose music is filled with rich, beautiful harmonies. They have worked as studio and backup vocalists for many years and began singing together as Sayani in 2003 to share their own music.... from their hearts. Most songs, written by Jorie West who is a Cherokee/Creek singer-songwriter, are Native American but she has included two Hawaiian songs to honor the culture and the people of the land where they made their home for many years. Their name, Sayani, is a Tsalagi (Cherokee) word meaning Zion and is pronounced Sah YAH nee. Most of the songs are performed in English but are peppered here and there with Tsalagi, Lakota and the Hawaiian language. Acclaimed musician, David Kahiapo, plays guitar throughout the album and has added a familiar Hawaiian flavor to some of their music to create a unique Native blend. Other guest guitars are performed by Leon Siu and Wayne Santos (Indian Blood, Sacred Fire), Charles Recaido from "Kohala", (Cherokee Pride, Come Closer) and the Ukulele was played by Gaymond Apaka (Puhi Bay). Mickey Ioane (best known for writing the song "Hawaii '78", sung by Israel Kamakawiwo'ole) played the Congas (Puhi Bay, Come Closer). Moses Crabbe, a respected Kumu Hula, translated the "Hawaiian Skies" chorus into the Hawaiian language and chants the Oli at the end. The Native American Flute is played by Jorie West and percussion by Christie West. This project was recorded and mixed by Charles Recaido in Kamuela, Hawaii, and re-mastered in 2009 by Vince Collins in Fort Worth, Texas. Prentice and Willena Robinson, owners of "Cherokee Made Easy"
"We like its clearity and Spirit quality and it has a special handling of the language"
"...............the music touches my mind, my heart, and then penetrates directly to my spirit where it speaks in so many ways....... I stopped, I listened, and I 'immersed' myself in the full message, softening my heart and quenching my dry spirit in the process........ you've bridged most of the needs and aspirations of the human condition without exploiting the usual litany of social woes and cultural grievances so often found in ethnic music. Your music leads the lost to hope, offers healing to the injured, and most importantly, reminds us that Father God first and foremost loves all people, without cultural preference or ethnic prejudice. This distinctive, complemented with excellent scoring and talented musicianship, sets 'Sayani' apart from that vast ocean of 'me too' music." "...totally awed by the beauty of your voices and the songs - very progressive and upbeat, yet still traditional. Love it!" "Aloha! What a joy to drive home to your new CD! It is awesome! Truly! I love the rich variety in sounds, styles, cultures and harmonies." "the cd got here today... it is on the player now.... it is beautiful.... i do not know anything about the music business, but this is GREAT... the vocals are GREAT and the instrumentation is also GREAT... i gotta kick back and play this again." "Your CD is absolutely fantastic! I just love it... I have it in my car and play it over and over." "The more I listen to this CD, the more I enjoy it. Beautiful soothing voices, harmonies and instrumentation. My personal favorite is Hawaiian Skies." I have received such a blessing from my CD. The music is truly beautiful, but the words really touched my heart. What a wonderful team: God and Sayani." For Song Lyrics, click here.